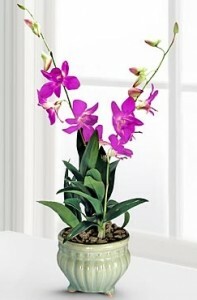 Enjoy Orchid Blooms All Year! in bloom? Year-round orchid blooms are not impossible, but with different varieties of orchids, you will have to remember to give each type their own specific care so that they will bloom and rebloom for you. * Some Catts bloom in Summer or Winter. ** Some Cyms bloom in Late Summer. Temperature: Make sure the temperature isn’t too hot—most orchid blooms enjoy temperatures up to 75°F (24°C). Lighting: Keep orchids out of direct sunlight, which can cause sunburn. Humidity: Avoid overly humid conditions because rot can set in. Watering: Continue to water your flowering orchids regularly and don’t mist your blooms, because too much moisture can cause disease or spotting. Keep insects away from your flowering orchid because if an insect pollinates an orchid bloom, the flower will wilt and die soon after. Keep your orchid away from air pollutants (i.e. aerosol sprays, paint thinner, smoke and the ethylene gas released from ripe fruit) because they can cause orchid blooms to fade. Having at least one orchid in bloom at all times can be a fun challenge. It will take some careful thought and planning on your part, but being rewarded with beautiful orchid blooms year-round is priceless!